For our honeymoon, Katrina and I embarked upon a three-week camping-hiking-and-scuba-diving trip to Kauai, the "garden isle" of Hawaii. Like most Alaskans, my parents discovered Hawaii a few long winters after our move to Alaska, and since then have visited Kauai Island nearly every year, typically around February. During the spring break of my freshman year at college, my father took me to Kauai for the first time, to the majestic and isolated Kalalau Valley. Now, three years later, I was back in Kauai, this time as a "seasoned visitor", showing Katrina that which had so awed me on my previous visit, and also exploring new facets to this charming island. Katrina has also written her own account of our past year, her memories from the wedding, and about our new home and future plans. For those who are interested, please read "Our first Christmas letter, a few months early!" One of my fondest memories of Kauai is scuba diving. This is not to say that Kauai is actually the most ideal spot for scuba diving -- it's probably not. But it is a pretty good place nonetheless, and only on a honeymoon could I justify spending a thousand dollars for the two of us to get scuba-certified. And what a great way to spend a thousand dollars! By this point, I had already done an "intro" scuba dive three times now (where a certified instructor teaches you how to use the scuba equipment, and then guides you under water, pointing out unusual and pretty sea life while vigilantly watching over you to make sure that nothing goes wrong). My first dive had been on the Red Sea in Jordan (http://zlatkovsky.blogspot.com/2007/08/visit-to-allahs-fascinating-land-jordan.html#Jordan_scuba), and my second and third with Katrina on the Mediterranean (in Corsica and Malta). But the intro dives are always done in shallow water (no more than 20 ft), do not allow for nearly as much freedom, and are actually more expensive in the long run then becoming a certified scuba diver yourself. So, having waited for two years since my first dive in Jordan to get certified, I was now ready to "take the plunge" (so to speak). On the second day, we dove in a confined ocean bay. We continued to practice skills, but, this time, the focus was more to get us comfortable with scuba-ing in the open water. We descended down a bland sandy beach, and then suddenly found ourselves surrounded by colorful corals and marine life. One memorable creature was a black starfish, with a small prickly body in the middle, and five thin, long "tentacles", reminiscent of spruce-tree branches. Another was a sea horse, uncommon to the area (usually they rest at some 200 ft below the surface, whereas this one was only some 30-40 ft below! ); another still was a sea turtle (I had no idea they were so large! ), sleeping peacefully in a nook between two large rocks. There were also countless fish of all varieties and colors, and one particular area housed a whole mega-school of fish, suspended motionless in the water, clustered so tightly that it looked like a woven blanket or a game of pick-up sticks, which parted around us ever so tightly as we passed through it. It was interesting to watch, too, how inter-dependent the fish were upon each other -- one sharp movement of a single fish caused the whole school to turn in that same direction. I think that Dr. Beavers was absolutely right when he remarked, once, that for all practical purposes, fish should be counted not as organisms, but as organelles, comprising the single grander entity of "school-of-fish" (whose intelligence is but an emergent property of masses of interconnected un-intelligent individual fish). One remarkable thing that I learned was that scuba-divers control their ascent and descent not through inflating and deflating the BCDs (buoyancy control devices) on their backs, but through taking deeper or shallower breaths. A diver, holding a normal breath, is supposed to be neutrally buoyant: in the water, he should neither rise nor sink, but simply float in place. This neutral buoyancy is accomplished by hanging a weight belt on the diver's hips, so as to compensate for all of the extra volume of air in the divers' lungs and tank. Once the diver is neutrally buoyant, he can simply exhale extra-deep to start the descent (and breath normally afterwards, descending by force of momentum), and inhale extra-deep to stop the descent and/or start an ascent. While breathing normally and continuously, the diver tends to oscillate within a foot or two in each direction from his desired depth, though it is possible to hover completely in place by taking short shallow breaths. One fun "skill" related to neutral buoyancy was a fin-pivot exercise: to lay on the sandy surface of the ocean, inhale deeply to rise to a 45-degree angle, and then exhale back to return to the ocean surface (like a push-up). Another was the hover exercise: to hover in place a few feet above the surface, taking care to neither damage the fragile reefs below, nor to rise too high as to not see them! The third day was more exciting still, for it involved two boat-dives (and an accompanying boat ride as a bonus!) Like the previous day, Katrina and I had an instructor to ourselves, though the boat also carried a second dive-master with a group of five divers, who were all a fun, talkative bunch. 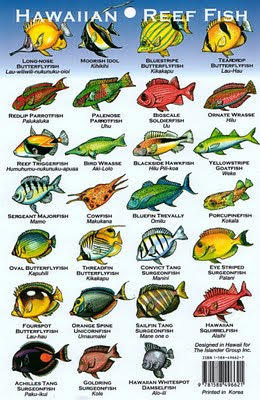 As the boat cruised by Kauai's shoreline, the second dive-master (a really hilarious lady) told us about the corals, the fish (and fish lips -- apparently fish have quite a variety of possible lip shapes), and plankton reproduction... good stuff! Our first dive was at the "House of Turtles", where we actually did see turtles -- a nice handful of them. The turtles are remarkably graceful in the water, effortlessly flapping their giant "wings" as they glided past us, rocking their heads side-to-side in a calm, fluid manner. It was a joy to watch! We also saw two ten-foot-long sharks, one of which was a recently-mated female (as seen by the scar on her shoulder -- male sharks make abusive husbands! ), who swam a short distance below us, fast and streamlined and rather intimidating in its cool indifference to our presence. 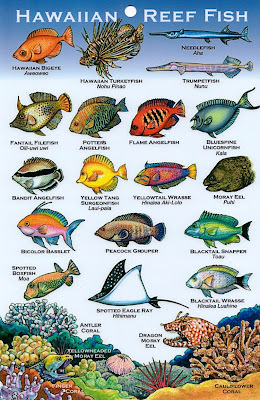 And then, there were the corals and fish, of course: colorful, alien, and fun! Some favorite fish included the long, big-eyed, alligator-shaped fish (a Needlefish or a Cornetfish), a striped fish that looked very determined and robot-like and kept reminding me of some sci-fi movie (Reef Triggerfish), the aptly-named Bluespine Unicornfish (just look at it! 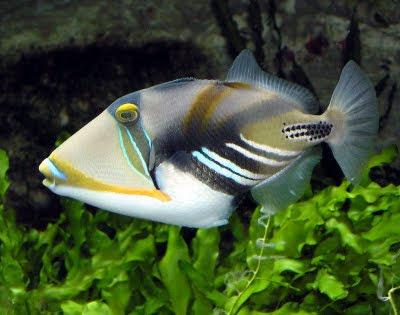 ), a black polka-dotted, really-long, jaw-snapping fish, and the ever-smiling Yellow Tang Surgeonfish. 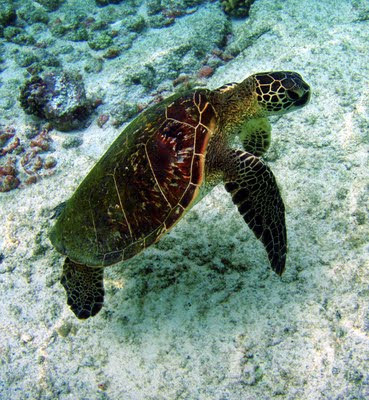 (If you are interested, YouTube has a video of someone else's diving adventures at the House of Turtles, including videos of the turtle's majestic flight through the water: check it out at http://www.youtube.com/watch?v=1cbtGd3xvl0, 7:50 minutes into the video [and elsewhere]). Oxygen tanks exhausted, we swam back to the boat, and were soon on the way to another dive site (quite appropriately for Katrina, the "Yellow Brick Road"). On the way, to our delight, we saw a large number of lavishly-twirling spinner dolphins, which followed the boat for a few minutes. Funny creatures, those dolphins... Then, with fresh tanks on our backs, we back-flipped off the boat (in itself a hella-cool skill!) and dove down once more, swimming at about 60-70 ft below sea level, and encountering oodles of fish. There were so many fish, in fact, that it seemed completely impossible not to brush by one of them as we swam, but (whether due to the magnifying effect of the water, or due to the fishes' incredible stealth-maneuvering skills), I don't think I ever did touch one! I also had a great time watching my air bubbles rise slowly and ceremoniously through the water, and/or poking other scuba-ers' bubbles and dividing them into ever-smaller crystalline air pockets. We saw another shark (6-7 feet long), this time swimming far up next to the surface, and passing only yards away from our unsuspecting snorkeling captain! Once on the boat, we also saw two purpleish-blue Ono (65+ pounds each), circling right underneath the hull, much to the dismay of our captain, who had forgotten his fishing rods at home! (Ono means "delicious" in the Hawaiian language). Scuba left me with a feeling of wonder and a longing to return to the ocean's colorful depths -- as soon as possible! And now that Kat and I are certified, it should hopefully be much easier to do... if only Bloomington were on an ocean! I have always loved the sea -- the constant power of its surging waves and the beauty of its swirling foam, and the enjoyment of sinking into sand with bare feet and watching footprints slowly fade away with each oncoming wave -- presumably due to my family's tradition each spring break throughout my childhood to visit Grandma and Grandpa Halpin in Florida and enjoy the beaches of Longboat Key. Unfortunately though, it had been four and a half years since I had last had the pleasure of visiting Florida, and two years since I had last swam in the ocean in Corsica during my year abroad, with this last pleasure being somewhat dimmed by the coldness of the water -- in May, the Mediterranean Sea was a bearable but somewhat chilly mid to high 60s. The ten-degrees-warmer Pacific Ocean coupled with the warm upper-80s Kauai afternoons of late May made swimming one of my greatest pleasures in Hawaii. Having spent five years of my life on the swim-team, I feel quite at home in the water, and with my first long-strokes towards the open sea, my long-neglected swimming muscles rejoiced as they played in the water, hovering afloat in the buoyant salt-water, sprinting towards beckoning waves, butterflying, and dolphin-spinning! Moreover, the beauty of these beaches was something that I had never seen, where the crashing of cerulean waves on crystalline sand is intermingled with the darkness of volcanic stone and framed by jutting cliffs and rearing mountains -- vertical accents that are jagged and wild, and yet gentle in the vigorous, green blanket of trees and plants that swarm upon their sides. On the Northern beaches of Ke'e and Tunnels, the sandy shores were interspersed with rock-like stretches of coral reefs, that only a few feet into the water harbored an unimaginable world of colorful fish! I have never found fish to be the most exciting species of wild-life, but these fish came in such a variety of shapes and colors, that were it not for humankind's instinctual desire to gulp for breath, I would easily have found myself in danger of drowning, forgetting to breathe from fascination of such a hitherto-unbeknown world of sea-life! Simply watching their manners of swimming was mesmerizing, as each specie had its own behavior of solitary foraging or sheep-like massing, forming schools of fish undulating through the sea like an enchanted flying carpet! Swimming off the shores of the Kalalau valley, I even had the great fortune to spot a sea turtle below me, creatures I had long dreamed of swimming amongst, and yet whose grace and majesty surprised me, seeming specimens from ages ago when the world was still young! On the shores of Manahupe we spent some time swimming amidst the colorful coral reefs, and once, gulping for air and diving below the surface again and again to catch glimpses of a large undulating red creature who seemed to be an octopus. There, too, we enjoyed the most picturesque intermingling of patches of volcanic rock formations amidst the white sand, creating little bays with still, emerald sparkles reflecting the sky above, the sand below, and the merging of sun and sea in sparkles and shimmers of all shades of blue and green! To the west of Secret Beach, we walked along one of my favorite coasts on Kauai, that of pure volcanic rock, carved and pierced by the power of the ever-crashing ocean waves. The breaking of these watery waves against the rock created such feats of ocean power and such beautiful foamy dances that they were a pleasure to watch, each crash causing a different size and style of dance, and each crash succeeded by the melting away of the previous surge, only to see the next surge reappear, stronger than the last! Amidst these rock formations, pools could be found of quite a deep depth, water left over from the out-going tide and warm and deep enough to be inviting to swim in! Moreover, this walk among the rocks (for which I highly recommend to anyone interested to wear water shoes: our first attempt along these rocks brought such pain and discomfort that the beauty was entirely lost!) brought us to a beautiful waterfall, where an inland stream flowed down upon the rocky shore to intermingle with all the other streams that have found their way to the great blue ocean! Standing under a real waterfall has been a long-held dream of mine, and here was my chance! Despite the slipperiness of the wet and mossy rocks and the cold of the stream-spray, I crawled my way over to the bottom of the falls, and -- pound, pound, pound! I must say that I had imagined this moment to be slightly more poetic, with streaming water flowing over me and the veiled colors of the sun reflected through it. Instead, it was such a heavy flow that I could not see through it, and once under it, I felt like I was being beaten over the head with a hammer! Ah, how sad to see the illusions of childhood disappear! Nonetheless, the waterfall was beautiful, and it was an interesting experience to stand amidst it! Above all, the beauty of these beaches was created by the constant variations of streams of sunshine interplaying with the colors of the sparkling water, the swirling clouds displaying all shades of the setting sun, and the movement of the water itself, constantly undulating and surging, pushing forward and pulling backward, swirling amidst itself in gaping chasms that close moments thereafter -- colors and movements to which the pictures can hardly do them justice! It is hard to imagine that a small island of only 550 square miles could house such different scenery as that found on Kauai. With the benefit of having our own rented car, we had the freedom of visiting all the parts of the island that we could desire, and as such, towards the middle of our stay, we drove up the half-hour winding road from the coast to the inland peaks where we spent our next five nights camping amidst the 10-degree cooler, 5,000 feet higher mountainesque interior of Koke'e. The jungle-y, mosquito-y forests and red earthen trails could not have presented a greater contrast to the sandy beaches we left behind. Here we had two memorable hikes, the first along what was called the Alakai' Swamp Trail, which promised spectacular views along the way. Beginning through a jungle-like forest with unusual trees and alien-like vegetation, (see the hairy-stemmed, claw-like stage of the developing fern!) the path proceeded along a colorful dirt trail, in which the island's natural red and orange clays intermingled with rich purples, blues and greens caused by natural mineral accumulations. Towards the end of the trail, the dirt path transitioned to boardwalks meandering among a boggy swamp with a variety of mossy, shrubby growth (I have always loved to play with different textures as a child, from mud to peanut-butter-ball dough, and I must say that this mud had the coolest texture I have ever felt: it was squishy and soft, and yet held together and resisted impressions… quite fascinating!) The unusual vegetation, the striking colors of the natural ground, and above all the mist flowing in and out over the green growth of the valleys falling away below us and the distant blue of the ocean made this trail seem a mystical journey, reminiscent of the ancient Hawaiian rituals involving shells, grass skirts, swords, and a mysterious connection with the inner soul of the island. The second trail we took offered even more spectacular views, as it followed the inner ridge-line of the famous Waimea Canyon. This 10-mile-long canyon was created from the Waimea River flowing down from Mount Wai‘ale‘ale, a peak on the center of the island that traps so much rainwater each year it is actually known as the wettest spot on earth (averaging more than 426 inches of rain per year)! The steep walls of this canyon present a spectacular mix of colors: layers of black lava representing the different years of this ancient island's creation (some of which reach back some 5 millions years ago!) intermingled with the red dirt Kauai is so famous for, that results from the lava's long exposure to water and wind, which over time has caused the iron inside to rust. Unlike the true Grand Canyon, Kauai's offers the additional display of large expanses of green growth covering the valley's wall and the cheerful gurgling and crashing splashes of several impressive waterfalls, complementing the canyon's timeless immensity with the feeling of new vigor and life. Standing in awe of nature's power and blind vision to create such beautiful works of art, including huge arches and stone piles that surely seem to have been fashioned by man for prehistoric worshipping, the sight of the canyon's soaring white egrets frolicking to and fro, dipping and twirling throughout the wide, deep valleys offered the perfect proof of the continued vitality of this ancient place. Towards the middle of our stay on Kauai, I convinced Michael that I wanted to take a tour of the island's national botanical gardens, located on the southern shore near Poipu. Both of us really enjoyed our tour of the Allerton Gardens, though it turned out to be quite different than I had expected. Instead of wandering through miles of pretty flowers with lectures on different plant names and their properties, we were instead transported by the stories of our tour-guide back through the history of the island, beginning with the tale of the ancient Phoenicians who first colonized the island. Sailing on small rafts for months at sea, they survived their journey thanks to the animals and plants they had brought with them, which in turn helped their survival upon arriving on Kauai, whose native plants offered little edibility. Their chosen seeds and plants were selected for their numerous potential uses, not only as food, but as medicine, lumber, and tools. Looking down upon the now highly-nurtured garden valley, we were able to imagine the semi-bare valley that had first welcomed the Phoenician colonizers, attracted by the brackish water that offered the promise of plentiful fish and a fresh-water river nearby. Interspersed with stories of the plants we were viewing, we were then taken forward to the 19th century, when the entire valley and surrounding land was transformed into a sugar plantation, and for a brief while, welcomed the beloved Hawaiian Queen Emma, bereaved from the death of her son and husband, and whose short stay left long-lasting impressions upon the valley with the naming of many a deep-purple flower after her. And finally, arriving by trolley to the small one-mile lot we would tour by foot, we were transported to the hardships of WWII and the luxury and vision of a single man who transformed this land into the natural-looking jungle-inspired collage of green bushes, shrubs and trees intermingled with the occasional blooming flower, flowing creeks, mini-waterfalls, and various classical- and eastern-inspired sculptures and gazebos that welcome tourists today. The result of Robert Allerton's work has been a calm and soothing tropical haven, not overwhelming in a bright patchwork of conspicuous colors, but instead offering a shady retreat from the hot afternoon sun, with the freshness of misting water and rich oxygenated air. Having arrived on Kauai in the late 1930s, the rich Robert Allerton purchased a portion of the McBryde sugar-plantation then for sale to have a tropical-retreat from the cold winters of Illinois. On the island during December of 1941, Allerton suddenly found himself stuck on the island in the midst of a giant world war, and found, for the first time in his life, that despite all his wealth and riches, he could not bypass the war-time laws forbidding all civilian travel. Enduring his own manner of hardships (he was so to be pitied, stuck on a tropical island for years at a time! ), his long years on Kauai helped him fall in love with the island and gave him a vision of how he would transform the valley into a tropical jungle paradise. Once the war was finally over, Allerton then decided to donate his mainland park and manor home to the University of Illinois, and to bring his adopted son and skilled water architect with him back to begin work in the Kauai valley. Here there was an interesting story of how he cleverly chose to invite native workers to help with his landscaping, erecting trees and digging out streams, once everything had already been prepared and set in place. Thus, in one day, Allerton could save money and time by not hiring special landscaping labor, and at the same time make friends with the natives who could feel themselves a part of his work and benefit from a good lunch all at once! Later, upon returning to Illinois and discovering the chaos and destruction that had been wrought upon his campus donation, Allerton clearly stipulated in his will the desire to have everything in his Kauai garden maintained by the National Tropical Botanical Garden (which he had helped to start) exactly as he left it. After the death of the Allertons, our tour-guide led us finally forward into contemporary times and the modern reality of needing to hold true to Allerton's last wishes in his will, despite its cost. For most interesting of all was the discovery that everything we were seeing, all the natural-looking tropical vegetation, was naught but an illusion, one that cost some 65 gallons of water a day to prevent the whole "paradise" from dying away and returning to the island's natural sparser and dryer vegetation within one month! The importance of maintaining such a costly illusion, due to the stipulations of Allerton's will and the desire to conserve the land for public research and tourism struck me as a strong demonstration of the shifting values of humanity over the centuries, from the land, money, and effort being spent towards transforming nature into a pleasure garden for the individual enjoyment of a single rich man to the focus of conserving land for humanity at large, now that land has become such a precious commodity and each person has continued to gain greater worth in world eyes. Along the way, we were also enlightened by interesting stories about the plants we were seeing. Mango, for example -- such a popular tropical fruit and so enticing to weary hikers hanging on the many wild trees growing alongside the island trails -- is of the same species as poison ivy! The liquid produced in the stems of the fruit cover the fruit with its poison-ivy-like protection, that makes picking the mangos with bare hands a dangerous endeavor! It is instead better to pick them up with a shirt and let them sit a few days until the poison-ivy-liquid has a chance to wear off. A good tip to know before starting a week-long hiking trip! Moreover, another good tip to know is that apparently poi, a staple on Hawaii made from the taro plant, is so filling and full of nutrients that not only would it be a good sustenance on a long hike, but it was also known to quiet babies all through the night! And one particular tree showed an amazing story of survival: when during storms or strong wind, the tree was pulled up by the roots and toppled over, its branches could actually dig into the ground and act as roots, allowing the tree to live just as long sideways as it would have lived upright! Our last exciting venture in the gardens was getting to visit two of the filming sites for Jurassic park, one through a jungle walk where the scene of the attack of the hunter by the three velocirapters was shot, and the other of the large bay fig trees used to film the discovery of the somehow-born-in-the-wild-to-all-female-dinosaurs egg shells, and where the two kids pet the "vegiosaurus" from the high branches. The roots of this tree were indeed huge and Jurassic-looking, but it was moreover an interesting irony that such a movie with such a message of life somehow "finding ways" to survive and evolve would be filmed in this man-made, unnatural garden, one in which masses of water are required to maintain the illusion of a natural jungle, and one in which a variety of strongly invasive plants, including the famous bay fig trees, could easily take over the island if they were let loose, destroying native plants and natural variety, and held back now only by the efforts of gardeners and the current lack of pollinating species to these introduced plants. The "Ultimate" hike on Kauai is considered to be the Kalalau trail, leading through the remote and rugged Na Pali coastline to the majestic splendor of the Kalalau Valley. The trail twists and turns along the near-vertical mountain slopes, up and down, into small valleys and back out of them, onward and onward. It is only 11 miles long, and both the start and the finish are at sea level -- but, between all of the ups and downs, 5,000 ft of elevation are gained and lost, and the trail is gruesome under the hot sun and with a large backpack. Finally, the trail gives way to a large, semi-circular valley unlike any other along the way: two mountains, tall and intricate, stand as sentries on either side, while the whole of Kalalau, like an amphitheatre, climbs upwards into the interior of the island, sending down shoots of green and intricate hills, reminiscent of spruce trees. By the trail, a green meadow -- sometimes with wild sheep grazing nearby -- slopes towards the sea, some 100 ft below; and, through the heart of the valley, a large creek bubbles gaily as it slips by rocks and trees, forming myriads of little pools along the way. A mile away, a sandy beach approaches the ocean, into which the sun dramatically sinks every evening amidst a sea of glowing clouds. It is a magical valley, but there is a price to pay for this magic: the trail, with 8-days worth of supplies on one's back, is no cakewalk. On the way there, my backpack weighed between 55 and 60 pounds, depending on how recently I had filled up my water bottles; Katrina's too, was upwards of 45. Some of the weight was sheer idiocity: for the first two miles (until some bleedin' wild cats ran away with it, and in so doing saved my back! ), I carried two pounds worth of pasta sauce -- not the most ideal camping food! But most of the other weight was necessary: two backpacks, a tent, sleeping pads, blanket, clothing, camping food, snack bars, gas stove, fuel... With a backpack rising far above my head, I looked like a sweating, exhausted ant, trying to carry a twig too large for its own weight (Kat: "Does any ant actually sweat? -- then again, does any sane human actually hike this trail with a 60-pound backpack?!")! But how gratifying was the sight of Kalalau, when, standing on the "Red Hill" at the very "lip" of the valley, as ruddy-cheeked as the red dirt below us, we could sense that our destination was mere minutes away! Like a mountain goat I raced down the slope (admittedly, with the backpack being as heavy as it was, I had no choice but to obey gravity's pull! ), ready to kiss the spot where I could finally lay down my backpack! We set up our tent on a bluff right next to the green meadow, some 20 feet away from the near-vertical drop to the ocean; from there, we had a magnificent view both of the valley behind and the ocean below. In the days that followed, we kept the tent as our base camp, returning to it each evening to cook dinner and to watch the sunset, while we spent most of the rest of our day exploring the valley sights. And sights there were! Within the very heart of the valley, the creek provided a ceaseless variety of pools and cascades, each with its own unique look and murmur. The Ginger Pool, the "Twin Falls", the "Troika" Falls... each was a treasure in its own right! Some of the pools were deep enough to swim in, and we'd swim against the current, which proved harder and harder as we neared the head of the fall; other sections were more like a slip-and-slide, slippery and swift; others yet were best left alone, as the powerful creek sent shimmering pulses of water into the air like a waterwheel. We hiked -- mostly along the river -- as far as the Big Pool, some two miles into the valley, catching glimpses of a waterfall on a distant slope; along our path, we also came across the stone remains of ancient Hawaiian dwelling places and walls. Apart from the sea turtle, we saw a group of dolphins almost every morning, though the dolphins were too far away to see them in great detail. (We did get an offer to go on a kayak with another couple to view the dolphins, but when we woke up in the morning, our ride was gone -- see the "Ranger" section). We also observed some birds (most notably, Katrina's favorite South American Cardinal) and some really tiny frogs (less than 1/2 inch in length!) at the river. The only other notable animals were the mountain goats, though they seemed to be less plentiful this year than when I had last come. Speaking of mountain goats, those grass-chewing pellet-dropping machines can actually be a quite a hazard! On my way back from Kalalau three years ago, I was walking along the trail on one of its steeper parts, with near-vertical cliffs above and below me, in the drizzling rain. I was listening to my mp3 player -- a cheap $40 kind, which, over its long life and particularly over it rainy stay in Hawaii, had developed a particular pickiness with regards to responding to its buttons. After fiddling with the mp3 player in my pocket, I finally stopped, took it out, gave it a nice little shake to recognize me by, and proceeded to wiggle its capricious buttons into obedience. As I did so, a large rockslide tumbled over the very spot where I would have been walking, had I not paused; evidently, my approach had scared a few timid goats, far overhead, who were now hurling stones at me in retaliation! And the fickle mp3 player -- that attention-demanding, unresponsive, extra-sensitive piece of $40-dollar electronic junk -- well, it just saved my life! No account of Kalalau would be complete without describing "the locals". They are an eccentric and lively group of people, who come to Kalalau not like us "tourists" -- those who come for only a few days, whose gear is of showy REI brands, who carry camping fuel for cooking and chlorine tablets for filtering the water, and who, when not hiking, belong to the "normal" outside world -- but as residents, who walk barefoot (and/or bare-naked! ), who stay for weeks, who have little gear, and who have chosen to come to Kalalau precisely to escape the "normal" outside world! Some live in bamboo huts that they have built deep in the valley; others simply carry a pack on their backs and sleep or eat where it pleases them, visiting fellow "locals" or sleeping ‘neath the sky wherever the evening finds them. They share a common culture, talking of the "powers" of Kalalau, calling each other "brothers" and "sisters", wishing "blessings" upon everyone they meet, and sharing communal food (often cooked around their large campfire in the "Sanctuary" -- a large camp of many a strung tarps, decorated with Hindu flags and other tapestries). Their Sanctuary was in the woods immediately behind the bluff, not far from our tent; and, in the evenings, we sometimes did hear them talking and laughing and playing musical instruments, and once they even gathered on the bluff to have one of their guys demonstrate some pyro-acrobatics. "My first recording, entitled Kalalau Stew, was literally a dream come true. I've been playing around campfires for years and often thought about recording some of these fantastic jams. But I wasn't about to leave the woods to make it happen. Eventually someone showed up with portable recording equipment and we made this CD... and I never had to leave the valley, make a phone call or sign a contract." One of the first locals we met was a handsome guy with a huge 6-foot stick ("telescope", he joked), which he said was a musical instrument, like an oversized flute, but one that he fills with stones to get it to the proper pitch or resonance. Almost immediately we saw another local couple, most memorable for the girls' unusual attire: she was totally naked, but the large backpack on her back and the bag in her arms rendered her no more naked than if she were wearing a conservative swimsuit! A few days later we saw our "telescope" friend again at the Ginger Pool -- he knelt in front of it, put his hands together as in a prayer, and then dove headlong into the chilly water, kicking vigorously against the current until he emerged straight underneath a small waterfall. He opened his eyes, mediated for a few moments, asked us not to neglect to go for a swim ourselves ("blessings, blessings! "), and then disappeared down one of the many "hippie trails" (a mesh of small interconnected paths that extend throughout the valley). As for the couple, we proceeded to see them almost every day in the valley, clothed, more often than not, like the children of Eden. I should say that we were never sure if we had been camping legally. We had a valid permit, which is more than could be said of the locals, but it was only for five out of the seven nights we stayed in the valley, and we were camping on the bluff, whereas the "official" campsite was at the overcrowded beach. On our last full day at Kalalau, I was returning from the creek after washing dishes, when I suddenly heard the approaching roar of a helicopter, and, to my horror, realized that it had set right next to our tent, on the other side of the wood. The rangers had come! Racing back to the tent, I tried to regain my composure and to prepare an answer to any possible question from the ranger. Why were we camping at the bluff? Because, when we came in, we saw another tent here, and there seemed to be nothing to indicate that this was not allowed. Why did we stay an extra night? Well, I'd have to bend the truth on that one, but I could say that we were planning to leave the day before, but I had injured my leg on a slippery rock at the river, and was waiting an extra day for it to heal, before embarking on the treacherous trail. To each good thing there comes an end; after spending six nights at Kalalau, we took one last stroll up the river and down the valley, stood for one last time on the perfectly-aligned rock in the center of Kalalau, and then headed back to civilization -- up the Red Hill, down the other side of the valley, over a dusty bare section, and up, up, and onwards... for 11 miles. Our food supplies exhausted or left behind, our backpacks were significantly lighter than on the way to Kalalau, but it was still a full day of strenuous journeying before we made it to the trailhead at Ke'e Beach. There we collapsed, thinking of the story that the kayaker couple told us a few nights before. The first time that the couple had come to Kalalau, they had come with a friend, by boat. One evening, as the lady was filling up water at the waterfall on the beach, a tall, sweaty, and seemingly delirious guy came up to her, grasping her hand. "Is that it then, the waterfall? ", he asked her with a trembling voice. She assured him that this was, quite undoubtedly, a waterfall; but what, she asked, was he looking for? Apparently, the poor guy was only intending to go to the waterfall that is 4 miles from the trailhead, but he had taken the wrong turn, and kept going and going, determined to make his journey worthwhile. Tired, without food or water, he fell down the Red Hill ("a controlled fall", he explained; "not too controlled", jeered the couples' friend, looking at the guys' dirt-splattered white attire and multiple scratches), and finally made it to the absolute dead end -- the waterfall at the end of the beach, past the 11-mile marker! "Where am I", "How do I get out of here? ", he kept asking. He was told that the only way out was the way in -- the 11 mile trail. "Then again", said the friend with the boat, "I could take you out tomorrow, two hundred dollars". "Two hundred? ", the guy hesitated, thinking of the large sum of money; then he thought back on the slippery trail, of his aching muscles, of his lack of water, and was glad to be let off so easily -- "can we go now"? In the morning, at dawn, we packed the tent and got ready to go. Before departing, I jumped into the completely deserted ocean for one last time -- the water was perfectly still in the protected bay, and, in the first rays of sunrise, the ocean was refracting all the colors of the rainbow, as if I was swimming through molten metal. It was a spectacular feel -- and a worthy end to our Kauaian adventures. Then we put the familiar packs on our backpack and hitchhiked out to Princeville, where we took a bus to the airport and flew back to Kansas... to a new life with a honeymooned wife!